Published: Nov 11, 2014 to ? "The New Gate," an online game that had turned into a death game, was now releasing the tens of thousands of players that had been dragged into it, thanks to the efforts of Shin, one of the oldest players. But after he had defeated the last boss and freed everyone, he was swallowed up by a strange light and found himself inside the game world 500 years in the future. I actually cant believe im the first to review... i mean this is a very well made and well thought out manga. its actually one of the manga im constantly keeping an eye on. now about the story: its not an original manga. goes about the story of video game turning real; HOWEVER it is one of the best in the way that it is so realistic, even if the main character is OP. overall it is well made and very fun to read. it does have certain plot holes but their so small and few that it doesnt matter much if at all. 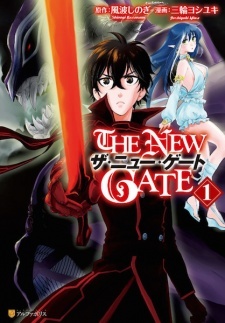 "The New Gate" is your average Isekai manga, with a pretty nice twist to it, it starts off with a world exactly like what you see in Sword art online, a death game where people were trapped in a VRMMORPG, the only escape being to beat the final boss, unlocking the logout button; "The New Gate" starts it's story off with the main character defeating the final boss, he decides to let everyone else log out first so he can be the last. Just as he goes to logout, a gate in the final boss room opens and he is transported to what he believes to be another world, but in actuality it's just the game 500 years in the future, which he later finds out. The main character, "Shinya 'Shin' Kiritani" has an extremely modest personality, being incredibly strong but acting like he isn't, just like in other series which include an OP main character and him being transported to another world, he decides to hide his strength to "avoid an uproar" such is the same in series like "Death March kara Hajimaru Isekai Kyousoukyoku". It has a range of supporting characters which all have their own abilities and personalities. I highly recommend reading this if you like Isekai, OP main characters, lots of potential waifu's and etc. You may get the impression that its a ,,Sword Art Online" copy for a first glance, but its NOT one! I gave it a seven because its not that bad, but it has some tiny plot-holes, not that they cause so many problems, but they are still there.. The characters show some development, and are really relatable and show some logic (Im talking about the new chapters, i mean at my time its only near chapter 30.. so yeah i mean those chaps). I dont know what more should i say, maybe they are .. colourful? And yeah there you go, hope you'll start reading it too!